Why not print out a copy and put it on your local notice board? 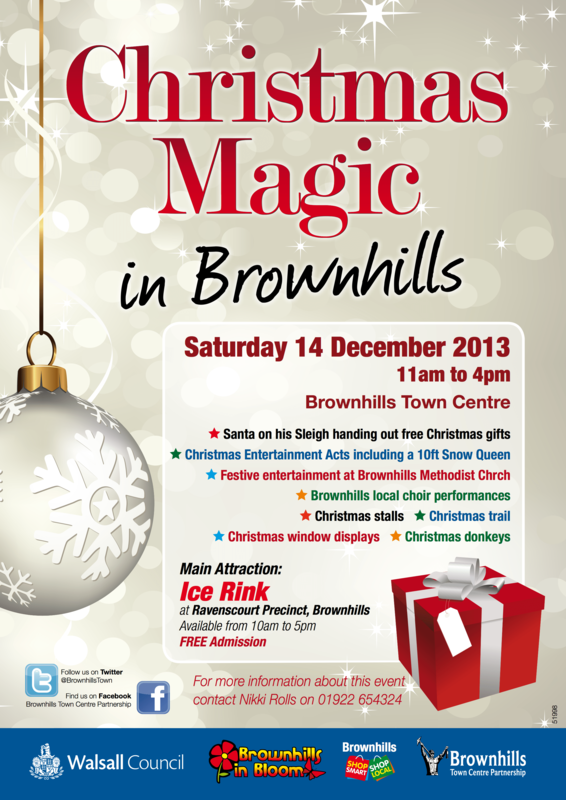 This year’s Christmas Magic event in Brownhills takes place today, 14th December 2013, from 11:00am to 4:00pm. I always like to support these functions, and thankfully, Nicky Rolls from Brownhills Town Centre Partnership (tipped off by the ever-helpful Brian Stringer) has sent me a copy of the flyer. This is the first Christmas Magic event since 2011, and it looks to be a cracker. There will be loads to do and see, like a free artificial skating rink in Ravens Court, local choir carolling, tons of stuff for kids of all ages, and even donkeys! Meanwhile, if you’re organising anything at all, please do drop me a line. I do like to promote local stuff wherever possible. It’s an easy way for you to reach thousands of readers a week, absolutely free of charge. 3 Responses to Christmas magic in Brownhills today! This really does look magical! Esp the Christmas donkeys!